You created your email marketing account with the best of intentions on day one of business. And maybe you sent some super valuable stuff whenever you could carve out the time. But, then life happened—whether it was personal or business distractions (or both!). You became more focused on partnerships, sales, funding, your family. And, that robust email list you spent time building unfortunately took a hit. It was screaming “winter is coming,” yet you ignored the Game of Thrones-esque warning. As a result, it’s now ice cold up in here. I totally get it. No need to lose sleep over this. Still, you know you must heat things up a bit and send to your email list sooner than later. Why’s that? Because email marketing is very much alive and well. I’m sure you don’t want to send your subscribers straight to the wastebin. After all, you worked hard to persuade them to sign up in the first place. So, it’s time to re-engage them and ultimately win them over. You’re walking a very fine line, however, because you want to avoid being awkward—popping back into their inboxes like everything is rainbows and butterflies after months of radio silence. That’s a quick way to get a mass amount of unsubscribes. And, you also want to be sure to sprinkle in the perfect amount of email etiquette. The last thing you want is to be flagged as spam. Ick. That’s why today, I’m sharing with you four proven strategies that will help you properly reignite your subscribers. Despite familiarizing yourself with these strategies, you still might cringe at the thought of having to map out out and write a warm-up email sequence. Understandable! It’s a serious undertaking. Good news is, I have just the thing you need, which I’ll share with you here a little later on. Thanks to one-of-a-kind software, all the writing can be done for you in a matter of minutes, helping you avoid another random “hey there” and dropping off the radar all over again. Stay tuned below! 1. Make a good second impression—re-introduce yourself, gently. You’ve probably experienced one of those uncomfortable moments when someone walks up to you and says “Hi, [insert your name]! Long time no see.” But, you can’t recall who they are, what their name is, and how the heck they know you. Think of your subscribers feeling that same way when you finally wander your way back into their inbox. Don’t just assume they’ll remember who you are right off the bat and how they got on your list. Oh, and also don’t draw attention to the fact that you haven’t written lately. What you should do, however, is keep your re-introduction short and sweet. Inform them of what you’ve been up to lately—the positive side of things. For example, were you taking a sabbatical to throw yourself into training and learn about state-of-the-art methods to boost conversion rates? Share it! In doing so, you make a good second impression, illustrating you’re staying abreast of any changes in your industry. And, most importantly, jog their memory, briefing them about why they opted-in to your list in the first place and why they should stay. 2. Wine and dine them—give them something of value. In order to get back on your subscribers’ good side, you need to offer up something of value. That way, you shed light on the fact that you’re here to help them, not just to sell, sell, sell, and talk about how great your product or service is. So, how exactly can you successfully burst into their inbox bearing gifts? And not just gifts that get the “Oh, great! I will never use this!” reaction? Give them a golden nugget of some sort—a freebie, a bite-sized tidbit of information, something, anything they would find handy to help solve their biggest headaches. You could offer up a new blog series, podcast, quiz, no-pitch webinar, eBook, cheat sheet, special report, complimentary service (no strings attached), you name it. Just be sure to never stop wining and dining them! Let your subscribers know they’ll have access to more useful freebies in the near future. That is, only if you can keep that promise and continue to deliver. 3. Keep it friendly—act like a real person, not a corporate machine. It’s going to take some time to rebuild trust and interest. But, what you can do to speed up the process a bit is use a more conversational tone—less stuffy sales speak and more friendly chitchat. Start with a casual intro like “Hey, [insert subscriber name]!” With today’s email automation techniques, you can easily begin doing this in all of your emails (if you’re not already) to serve up a more personal touch. But, that’s assuming you’ve collected names from your list. If you haven’t, still implement this method with a simple “Hey there.” Isn’t that 10 times better than the formal approach of “Dear Valued Customer”? Absolutely! You can also get on the fast track towards rekindling your relationship by throwing traditional company branding out the window. What I mean by this is don’t plaster it across the header of your email marketing communications. Be real and down to earth, which will go a long way towards humanizing your brand—calling attention to the real people behind it. Ultimately, start banking some much needed brownie points by serving up less desperation for your audience’s attention and money, and more delightful conversations. 4. Kick it up a few more degrees—throw in a solid call to action. Wrap up your email and tie it all together with a nice little bow. Show your appreciation, let them know what they can expect from you here on out, and invite them to take action by including a clickable link to whatever freebie you’re offering up. An inviting call to action will supply your subscribers with a greater amount of motivation to follow through on what exactly it is you want them to do next. Let’s be real for a second. It can be as straightforward as: “Hit reply to let me know how you’re doing.” Asking for a simple response really takes the cake. Not only will it get you some potentially invaluable feedback, but it will also boost your deliverability. How exactly? Well, the more people who unsubscribe from your list or mark your communications as the dirty “s” word (hint: spam), the more your sender reputation takes a hit. Your sender reputation is everything in the world of email. Hence the importance of steps #1-3 and topping your email off with a strong call to action that gets your subscribers to stick around. Still trying to cozy up to crafting an email sequence that defrosts your subscribers? I absolutely get it. It’s not an easy thing to warm up to because writing can sometimes be an arduous task. The very thought of it probably makes you want to crawl back into bed and call it a day. But, putting together a warm-up email campaign should be a no brainer for you. After all, sending sporadic messages is pretty lousy. Lucky for you, I’m about to knock your socks off with a tool that will get you out of the copywriting rut and back into your subscribers’ inboxes in no time. That tool is ScriptDoll, a sales copy engine dedicated to helping entrepreneurs like you compose persuasive sales content. Once users create their product portfolio and answer a handful of painless questions, ScriptDoll drops those answers into thoughtfully crafted content scripts that sell—sales letters, email sequences, you name it. Best of all, ScriptDoll has just what you need to quickly and triumphantly warm up your bitter email list with the “List You Let Go” Email Sequence Script. This six-part sequence can be set up to deploy as an auto-responder when you’re ready to reconnect with your subscribers, reminding them that you are here to help and provide value—not just sell things. Ultimately, it helps bring them back to the reason they signed up for your email list in the first place. Crafts sizzling content for you—thanks to the product portfolio I mentioned earlier, the subject lines, body copy, call-to-actions and even signoffs are all done for you. ScriptDoll provides you with the valuable, personable content you need to reignite the flame between you and your subscribers. Solves the content flow dilemma for you—when should you share a value-added piece of content? Call attention to your audience’s biggest obstacles? Hit them up with a sale? Throw in some scarcity to light a fire under their tail? The script answers these tricky questions as it develops the flow of emails for you. You won’t need to waste countless hours determining the perfect sequence to successfully re-engage your subscribers. Keeps the content flowing with a distribution schedule—you won’t need to spend hours trying to figure out when it’s appropriate to send another email after your first reintroduction correspondence. The script informs you of the right time to hit the send button on each of the six emails, helping you ease your way back into their lives while giving them time to respond. That way, you’ll avoid a horde of unsubscribes or, worse, getting marked as spam. So, there you have it. You’re no longer a stranger to what ScriptDoll is and what it can do for you and your business. Now, imagine how your subscribers will react to less unpredictability and more consistency as a result of you using this tool. Can you also envision less stress on your plate because a plethora of content can be created for you in minutes? Wow, I bet that sure is great to think about. Okay…now, what are you waiting for? Hurry and defrost your email list, transporting your audience straight from Antarctica and into the tropics! Get Your Personalized Warm-Up Email Sequence Template Today! It’s time to get started on converting your email list from fizzle to sizzle. And you don’t have to wait another minute! You now have the four steps you need to bid farewell to the chill. Plus, a tool to quickly and victoriously win back the affections of your audience. Entrepreneurs just like you are finding success with the ScriptDoll Software—escaping the communications ghost town and saying hello to persuasive sales copy that helps convert leads and retain customers. Go on and join them to get results that are far above freezing—dust off your subscribers and rekindle the flame! 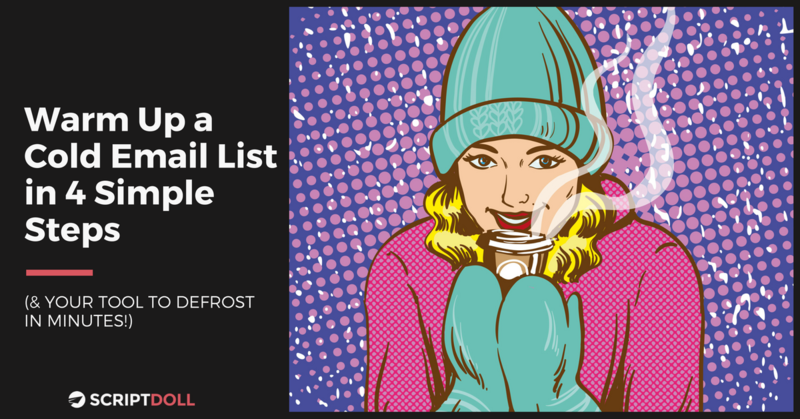 Defrost Your Email List in No Time – Join ScriptDoll!